After almost six months of operation, experiments at the LHC are starting to see signs of potentially new and interesting effects. 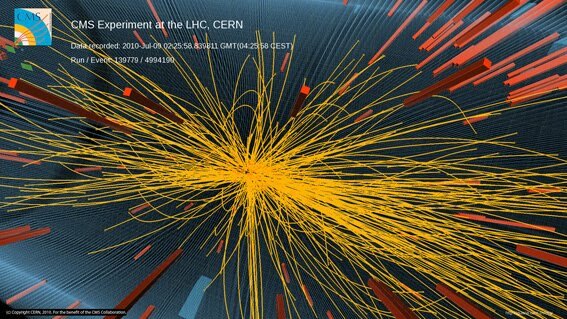 In results announced by the CMS collaboration in Geneva, correlations have been observed between particles produced in 7 TeV proton-proton collisions. Having re-measured known physics in time for the summer conferences, the LHC experiments are now starting to probe new ground. ATLAS recently extended limits on excited quarks, while the LHCb detector has demonstrated its capacity by observing atom-like particles built from beauty quarks and antiquarks. In some of the LHC’s proton-proton collisions, a hundred or more particles can be produced. The CMS collaboration has studied such collisions by measuring angular correlations between the particles as they fly away from the point of impact, and this has revealed that some of the particles are intimately linked in a way not seen before in proton collisions. The effect is subtle and many detailed crosschecks and studies have been performed to ensure that it is real. It bears some similarity to effects seen in the collisions of nuclei at the RHIC facility located at the US Brookhaven National Laboratory, which have been interpreted as being possibly due to the creation of hot dense matter formed in the collisions. Nevertheless, the CMS collaboration has stressed that there are several potential explanations to be considered and the collaboration’s presentation to the physics community at CERN today focussed on the experimental evidence in the interest of fostering a broader discussion on the subject. “Now we need more data to analyse fully what’s going on, and to take our first steps into the vast landscape of new physics we hope the LHC will open up,” said CMS Spokesperson Guido Tonelli.